Kansas Cyclist is an information resource for people who are interested in riding bicycles in Kansas, both residents and visitors. This site features information about Kansas cycling clubs and bike shops, information about organized bike rides in the state, as well as general information about cycling in Kansas. The purpose of this site is to promote Kansas cycling; it is an independent informational resource, and is not affiliated with any other organizations. 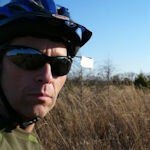 My name is Randy Rasa, and I am the webmaster here at Kansas Cyclist. As you might guess, I am a cycling enthusiast who lives in the state of Kansas. My primary goal in building this site was to inform people about the excellent cycling in the state, and to give a little bit back to the cycling community. Researching this site has been an eye-opening experience as I discovered the huge variety of cycling experiences and events in the state. I hope that you enjoy exploring this site as much as I've enjoyed creating it. In addition to this site, I also run a number of other sites. You can see my entire portfolio at Cleversoul.com. I also do freelance web design. I am also available for interviews or commentary; just use the contact form. This site is built on a foundation of Apache, MySQL, and PHP. Pair Networks - I've used these folks as my web hosts for years. Reliable performance, solid service, and fair pricing. Highly recommended.